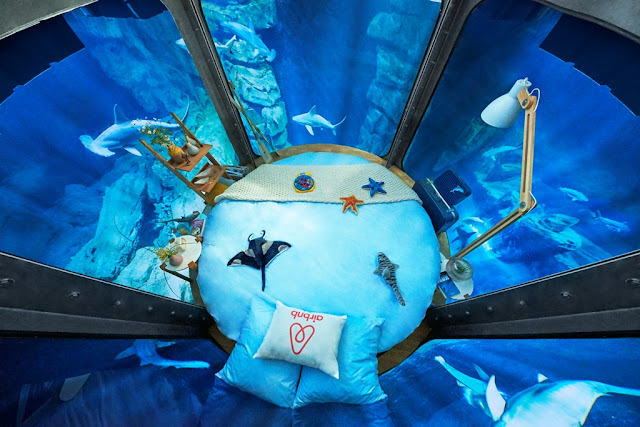 Airbnb, the world’s leading community-driven hospitality company, unveiled the most awe-inspiring Airbnb listing to date – a fully submerged bedroom in the shark tank at the Paris Aquarium where your closest neighbours will be 35 sharks. 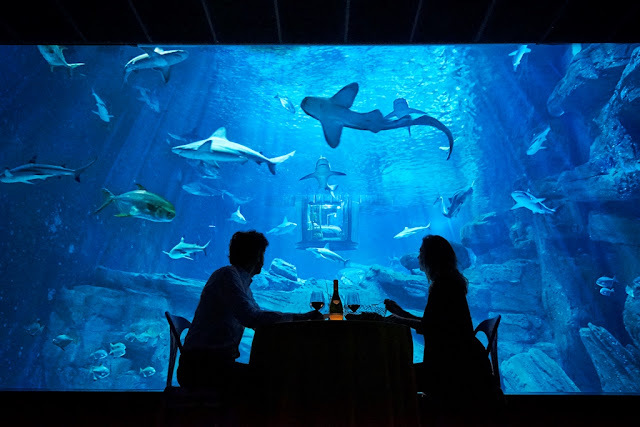 Hosted by the Paris Aquarium on the nights of April 11, 12th and 13th, this underwater bedroom sits within three million litres of water, in an aquarium ten meters deep and where the only thing separating the guests from the majestic sharks is a 360-degree transparent wall. Sharks are among the most feared and misunderstood animals in the world. You are for instance, more likely to die from taking a selfie than from a shark attack. This April, people will have the chance to get up close to these stunning animals and appreciate their power and beauty. Three lucky people and their guest will each get to spend a night in the underwater bedroom. They will be welcomed by host, Fred Buyle, a world record-breaking freediver, underwater photographer, and shark conservationist. He’ll dance alongside the sharks, the ideal introduction to your companions for the night. Once the guests are settled, Fred and one of the Aquarium’s marine biologists will guide them on a tour through the Aquarium, and provide an exclusive behind-the-scenes glimpse into the world of sharks: how they live, why they’re so misunderstood, and their importance to the ocean’s ecosystem. The winner and their guest will also enjoy an intimate meal, with gorgeous tank-side views of the sharks. Opened in 1867 and located in front of the Eiffel Tower, the Aquarium de Paris was the first of its kind to be built anywhere in the world. Designed specifically for the Aquarium and tested in the Mediterranean sea, the submarine bedroom will live on even after guests leave, acting as a study area for biologists, whether or not they are divers. The structure will reduce the number of dives needed and therefore the emission of bubbles, allowing the biologists to observe a more natural behavior of fish. The animals are already used to the custom built structure: they are curious, approach it and swim quietly. Visit the listing page to win the chance to spend one night in the Aquarium.Entrants are asked to tell a little about themselves, where they live and why they belong with the sharks for a night, by 11:59 p.m. CET on 4/3/2016. Not local? No worries. We’ll fly the winners in from anywhere in the world.The winner and their guest should be over 18 years old, medically fit and able to climb into and out of the bedroom. Note that for safety reasons, the winner and their guest must not exceed 190 kilograms. Submissions should be between 50-550 characters or less in English, French, German, Spanish, Italian or Portuguese and 50-300 character or less in Chinese, Japanese or Korean. ● No selfies after dark. Remember, sharks are sensitive to light. ● Avoid seeing Jaws before your sleepover. They’re kinder than you think! ● No sleepwalking or night swimming. ● Don’t eat the chum. ● Keep your heads and feet in the bedroom at all times. ● Sheep can’t swim, so count sharks instead. ● Don’t take the bait.